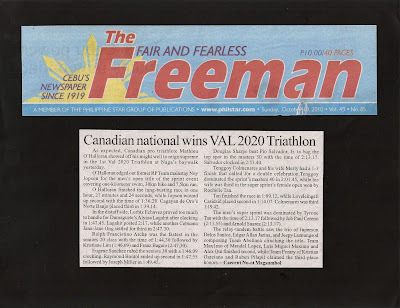 CEBU, Philippines - As expected, Canadian pro triathlete Mathieu O’Halloran showed off his might well to reign supreme in the 1st Val 2020 Triathlon at Naga’s baywalk yesterday. O’Halloran edged out former RP Team mainstay Noy Jopson for the men’s open title of the sprint event covering one-kilometer swim, 30km bike and 7.5km run. O Halloran finished the lung-busting race in one hour, 27 minutes and 24 seconds, while Jopson wound up second with the time of 1:36.20. Cagayan de Oro’s Norte Banjo placed third in 1:39.14. In the distaff side, Lorhiz Echavez proved too much to handle for Dumaguete’s Alyssa Lagahit after clocking in 1:47.45. Lagahit posted 2:17, while another Cebuana Jane-Jane Ong settled for third in 2:47.30. Ralph Francistino Arche was the fastest in the seniors 20 class with the time of 1:44.30 followed by Kristiane Lim (1:46.09) and Franz Baguio (2:47.30). Eugene Sanchez ruled the seniors 30 with a 1:46.09 clocking. Raymond Bontol ended up second in 1:47.55 followed by Joseph Miller in 1:49.45. Douglas Sharpe beat Pio Salvador, Jr. to bag the top spot in the masters 50 with the time of 2:13.17. Salvador clocked in 2:53.40. Tenggoy Colmenares and his wife Merly had a 1-3 finish that called for a double celebration.Tenggoy dominated the sprint’s masters 40 in 2:01.45, while his wife was third in the super sprint’s female open won by Rochelle Tan. Tan finished the race in 1:09.12, while Loveleingell Casidsid placed second in 1:14.07. Colmenares was third 1:19.42. The men’s super sprint was dominated by Tyrone Tan with the time of 2:13.17 followed by Job Paul Cereno (2:11.55) and Arnold Suarez (2:13.17).